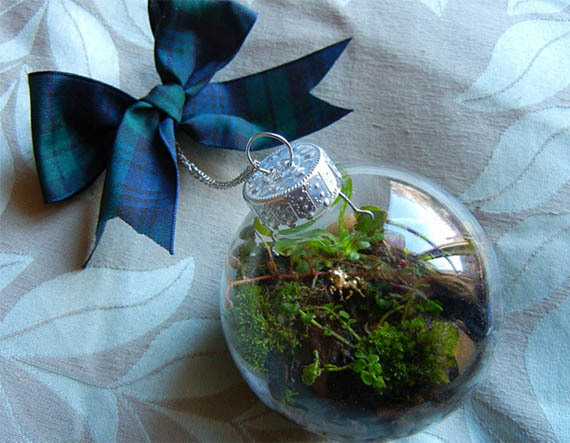 A Terrarium Christmas ornament is a lovely idea, but I wanna know who came up with it. Was someone seriously sitting around thinking, “You know what that giant plant in the middle of our living room needs? More plants!” Anyway, if you happen to feel that your evergreen could be just a little greener, you can follow this simple tutorial by Inhabitat and make your own Terrarium Christmas ornaments. You just need a glass ornament orb, some dirt, moss and miscellaneous plants and twigs. Bonus points if you add it to a fake tree just for the irony.